A short story celebration of the classic Western tale. Story blurb: Clete Benteen was a kid one minute and a man the next. The son of a sharpshooter, he grew up when his pa was brought home across the back of a horse, back-shot. Making a place for himself among hard cowboys, Clete must use all the skill he has to provide for his family and to find his Pa’s killer. But is he tough enough to survive? As the blurb tells us, young Clete Benteen (14 years old) is forced into manhood to support his widowed mother and fellow siblings, as well as avenge his father’s murder. This brings him into contact with his father’s employer, a powerful rancher by the name and style of Judge Terril, and a group of sinister, hired guns that Terril employs to enforce his power. What makes Clete equal to the others in some way is his skill as a sharpshooter; a skill he has both learned and inherited from his dead father. Other traits he has either learned of inherited are his fierce independence and self assuredness. 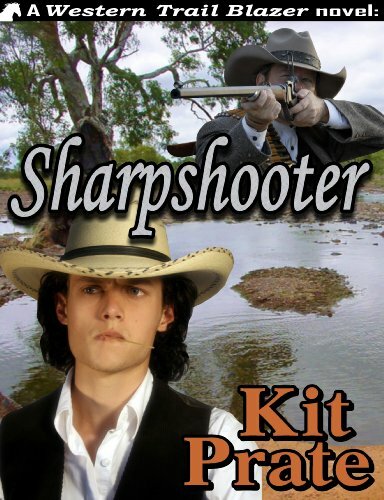 I bought into his sharpshooter’s skill because one of my main characters in an upcoming novel (“The Brit, Kid Cupid, and Petunia”) is a teenage shootist, but I was a little more questioning about Clete’s precociousness. Or, maybe it was the willingness of the adults—Terril especially—to let him get away with it. It is, however, only a minor quibble. As the story moves along there is a nice build up of tension, especially with his capture by the bad guys, and the contest of wills as his captivity continues under sometimes cruel and abusive conditions. After all, it wouldn’t be a true western if the good guys had a ‘cake walk’ of it. Altogether this is a great little read for the money, and worth every cent of it. Four and one-half bees. Stay up-to-date with Gerry’s Marvellous Adventure by visiting my personal blog from St. Augustine, Florida—North America’s oldest, continuously-occupied city. It is a mixture of personal news, history, and photos. I think you will find it interesting. Come count down the days ‘til Christmas on Speak its Name Advent Calendar. Great stories and prizes to be won every day. The sale figures are in for Two Irish Lads and Nor All Thy Tears, and while I can’t retire in luxury they are quite gratifying indeed. Thanks you to all those who bought and read them. If you would like to learn more about any of my books, or to order copies, click on the specific cover below. Two Irish Lads and Nor All Thy Tears are available in both Kindle and Nook formats. Publisher’s price, $4.95. Thanks for dropping by. Check back next week for my Christmas pick.